VietPress USA (Dec. 28, 2017): Democrat Candidate Doug Jones official certified as Winner of Alabama's Senator over Republican Joy Moore. During the campaign, GOP candidate Joy Moore got lawsuits against him for allegations of sexual misconduct with multiple women. President Trump came to Alabama to support Moore but he lost the election which Jones won by more than 20,000 votes. In a wide-ranging complaint filed late Wednesday night, the Moore campaign cited three “election integrity experts” who say voter fraud occurred; but the investigation finds no evidence at all. Alabama’s secretary of state laughed off the assertion by Roy Moore campaign spokeswoman Janet Porter that there is an incredibly high probability there was voter fraud in the state’s special U.S. Senate election this month. “People are entitled to their own opinion, but they are not entitled to their own facts,” Alabama Secretary of State John Merrill said on CNN. Merrill was responding to Porter’s comments in an earlier CNN interview in which she defended the Republican candidate’s 11th-hour attempt to block certification of Moore’s historic loss to Democrat Doug Jones in the traditionally deep-red state. Merrill said that his office has investigated each claim of voter fraud submitted by the Moore campaign and found no evidence any fraud occurred. In one complaint, it was alleged that five busloads of African-Americans had been brought in from Mississippi to vote in Mobile, and that three vanloads of Mexicans had been arrested and incarcerated for doing so. Both allegations were investigated and dismissed, Merrill said. Another claim said that more than 5,000 people had voted in Brodalama, a town with a population of 2,200. 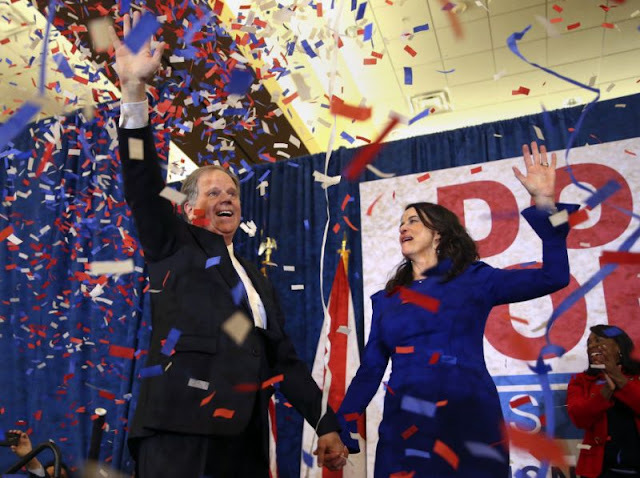 His remarks came shortly before an Alabama judge denied Moore’s lawsuit to block the state from certifying the results of the Dec. 12 special election, which Jones won by more than 20,000 votes. A four-member panel, including Merrill, certified those results Thursday afternoon. Jones will be sworn in by Vice President Mike Pence on Jan. 3. “As I said on election night, our victory marks a new chapter for our state and the nation,” Jones said in a statement. Yet Moore again refused to concede the election. In a wide-ranging complaint filed late Wednesday night, the Moore campaign cited three “election integrity experts” who say voter fraud occurred. One of them, Richard Charnin, argued in a recent book that President Trump won the “true” vote in the 2016 presidential election (Hillary Clinton won the popular vote by nearly 3 million votes) and that “historical statistical evidence is conclusive: every election is fraudulent.” In another, Charnin argues that there is scientific proof of a conspiracy surrounding President John. F. Kennedy’s assassination. “I don’t vouch for everyone’s opinion on everything,” Porter said when asked about the theories offered in Charnin’s books. Porter also defended Moore’s inclusion of an affidavit in the lawsuit saying he had passed polygraph test that purportedly disproves the allegations of sexual misconduct by multiple women against him. But when pressed for details about the test or the person who conducted it, Porter struggled to provide any. The affidavit was from Moore, not the unnamed polygraph expert. “All I know is that it was a renowned independent expert,” Porter said.